New categories for the 2019 competition! Registration is now open! Each year, CDI hosts the resume writing industry’s most prestigious Toast of the Resume Industry™ (TORI) resume writing competition. The TORI™ Award competition is truly the resume writer’s #1 secret to explosive business growth. CDI members are eligible and encouraged to strive for writing and creative awards, which benefit the general membership, members’ clients, CDI, and the industry as a whole. CDI introduced the TORI™ Awards to the industry in 2000 to celebrate a new standard in excellence through rigorous criteria requirements. While award standards have always been demanding, never before has the resume writing industry embraced the concept of a standardized criteria for resume judging. 2019 offers ten (10) categories to enter! There are 50 chances to be nominated and 30 chances to win with gold, silver, and bronze awards! But you can’t wait or you could miss out. Ready to enter? Scroll to bottom of page. Not sure the TORIs are for you? Tremendous ROI of being nominated or winning (expect your business to take off overnight). Valuable expert-level free member resources you can use to hone your resume writing design skills. 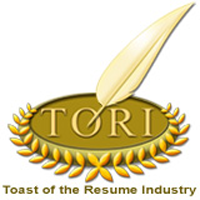 Tips on what makes a winning TORI resume. Common mistakes that are made with entries and how to easily avoid them. Ways to get into the mindset of a TORI resume writer. Strategies for making time to enter this year. It is a great honor to be nominated, but a truly distinguishing accomplishment to be selected as the 1st, 2nd and 3rd place TORI Award Winner in each category. Imagine you woke up this morning, a morning seemingly like every other morning except for one considerable difference – today you’re swamped with new resume clients who are excited to have the chance to work with you and pay your rates. So, what’s so different about today that suddenly your prospects seem to be sold before you even talk to them? Why they appear to be waiting to work with you? Why it’s suddenly so much easier to gain their buy in on the higher rates you are quoting for your services? It’s the AWESOME power of taking home a prestigious TORI nomination or award. If that makes you feel skeptical, take a moment and look at the testimonials from your fellow colleagues in the right column of this page. While winning or being nominated will change your business forever, there are big wins for ALL who enter! Here’s the thing about the TORI Award competition — you need to throw caution to the wind and JUST DO IT! Telling yourself you are not ready, not good enough or worse, too busy, causes you to lose out on an amazing opportunity to challenge yourself, grow, learn, and even surprise yourself! It’s a loooong 365 days between each annual competition. Do you really want to wait that long to even challenge yourself and see where you rank in an anonymous review by a panel of industry top performers? #1 – You Win and Overnight You Become a Business Success. This one is a no-brainer, unless you discount just how much of a difference a TORI can make. Just read some of the testimonials below if you aren’t sure. It’s a total game-changer. #2 – You Get Nominated for a TORI and Discover It’s Better Than Any Advertising You Could Ever Do. Believe it. You don’t have to just win an award to benefit — making the top five puts you in a class by yourself, as you will rapidly discover. #3 – You Win Just by Studying Winners. Success doesn’t exist in a vacuum so when you prepare for the TORIs and look at former winning resumes, you help yourself see other possibilities and explore new channels for how resumes can be written and designed. Spend some time with the TORI winning resumes and your whole idea of wording alone can be broadened immensely. It’s like taking a culinary world tour (if resume were food)! #4 – Taking a Chance Challenges You and Keeps You in the Game. Just like studying the winners, if you look at entering as a chance to elevate your skill, reach further, and present your best of the best, then you are winning in keeping your commitment to growing in your craft alive. #5 – Being Motivated to Go to the Next Level Charges You Up. Ever notice when you go to a live training event you feel charged up and rejuvenated? It’s because you are learning something new and that’s exciting. If you dive into the TORIs, study winners, and then look at how you can take your writing to the next level, you ARE rejuvenated. Is that a win? You bet – when you aren’t tired of doing the same old thing, you are eager and alive. You and your clients win! #6 – Solving Puzzles Builds Brain Muscles, Which Pays Off in the TORIs. Just like games like Soduko can challenge and stimulate your brain (and keep it fresh as you age), figuring out why you don’t win a TORI can be your brain-building business success puzzle (and magic bullet). IT IS A FACT that when those who don’t win sought feedback, made changes, and kept trying, they started to win at the TORIs. Many multi-time TORI winners were once entrants who previously didn’t even get nominated. Not getting nominated or getting nominated and winning is an exciting call to action to gear up and strive for the next level! Don’t let not winning stop you. Accept the challenge. If you do, you really can win, and win big at that! #7 – There are Multiple Winners Each Year. Getting nominated for or winning a TORI works, plain and simple. Otherwise, you wouldn’t see the same names entering year after year (becoming nominees and winners). While one TORI award or nomination can (and has) made a whole career, many choose to keep pursuing those wins each year and in multiple categories. The beauty is that with ten categories there are 50 chances to get nominated and 30 chances to win. You’re not vying for only one coveted award — there is plenty of opportunity! Take the advice of those who have come before you and cover your bases to win at this once-a-year career-making opportunity! Sure the TORIs are a challenge – it wouldn’t be a worthy competition otherwise. Like any competition, you might have to train, learning advanced skills, studying layouts, elevating your writing – building those muscles. Or, you might already be at a peak performance level of resume writing fitness (and maybe not even know it) ready to scoop up an award on your first try. It happens all the time; just look back over prior years and you will see many names you have never seen before! But either way, why make excuses not to enter….? Why not take a chance at being what appears to others as an overnight success? You just never know, unless you try! SO, MAKE THIS YEAR YOUR TIME. If you don’t want to wait until December of NEXT YEAR for another chance to see if you are a winner and what that can do for your business and your industry reputation, then go for it now. Commit to making time for this opportunity as it could change your life as a resume writer. Each year, the TORI Awards Director, in tandem with the CDI Board of Advisors, selects the most applicable categories which best reflect current market trends. CDI members are welcome to contribute one (1) entry to each category. The TORI Awards Director will ensure all submissions appear anonymous to the panel of judges so that fair and equitable judging can take place. The first tier of judges are all certified resume writers, members of CDI’s resume certification committee, and many former TORI winners. They are responsible for selecting five nominees in each category. A second similar panel of highly-qualified and certified resume writers will then select the first, second, and third place winners in each category, leading to 40 nominees, and 24 total winners. These are the ONLY categories available for entry in 2019. Best Marketing Resume (new) – Marketing encompasses so many areas of company productivity and growth for the organization (or that of the client). These may include, but not be limited to: social media marketing, digital/disruptive marketing, brand marketing, experiential marketing, field marketing, event marketing/planning, marketing analysis, advertising, e-commerce marketing, web producers, revenue officers, public relations, and even customer officers (CCO). Best Difficult Transitions Resume (new) – We’ve all seen clients needing guidance through challenging transitions. This covers any level of professional who is facing a major transitional career challenge such as: reentering a profession they haven’t worked in for 10-20 years; taking positions in a variety of different fields and using them to successfully target a whole new profession; overcoming major gaps in their career transition; or targeting a quality of life change that includes a lower-level position than previously held. Best Portfolio Careers Resume (new) – It’s a gig economy out there and the side hustle (job on the side) has morphed into a portfolio career. This individual won’t have one employer but several; they are thought leaders who like to get out there and be involved. This chameleon could be at any level of their profession and may have a mix of contract work, consulting work, adjunct professorships, board roles, and more. The purpose of this resume is solely to get more gigs – not to land one combined perfect position. Best High Tech Resume (new) – So many companies are dependent on technology now and it can encompass so many areas (some of which are emerging every day). This is very open-ended and includes levels from the tech to the executive in areas such as: digital transformation, machine learning, scientists, data scientists, cloud architects, network engineers, CTOs, big data specialists, project managers, app developers, web developers, telecom, engineers, and more. Best Hospitality (Travel/Tourism) Resume – In hospitality it’s all about guest focus, satisfaction, and the outcome ROI. This can include any level of hospitality position from entry to executive to owner. Areas could include: travel agents, cruise line staff, hotel/resort staff, tour guides, tourism company staff, event managers, food and beverage personnel, casino personnel, chefs, banquet/catering staff, restaurant personnel through owners, and bar staff/owners. Best Sales Resume – For most companies, it’s all about the money. Top sales producers are worth their weight in gold. This can encompass any level of sales, business development, account management, customer service roles, or producing sales management to the executive level. Bring on the metrics, awards, and accolades! Best Healthcare/Medical Resume – These professionals come in all shapes, sizes, and specialties with a bigger-than-ever focus on patients as consumers and an emphasis on the bottom line. They may have careers such as medical technician, doctor, surgeon, medical transcriptionist, laboratory staff, administrator, pharma, nurse, clinical researcher, PA, psychiatrist, psychologist, dental professionals, EMT, physical therapist, etc. Best Executive Resume – Powerful success starts at the top and these are the individuals that drive productivity, profits, company brand, and shareholder value. Roles include any executive-level position from Vice President and up in any industry. Best New Graduate Resume – Keep this to your new grads! It can include any discipline or industry as long as the focus is on leveraging a recent degree or diploma for a candidate who is just launching their career. NOTE: This is not for a mature professional with a 20-year background making a transition. The average candidate has been in the world of work with part-time, full-time, internships, etc., for no more than 8 years. Best Accounting/Finance Resume – Companies need accounting and finance professionals who can analyze, report with accuracy, and make the numbers work in a ever-changing economy. Positions could include any level of: stock broker, investment manager, clerk, CPA, finance manager, financial analyst, controller, private equity analyst, hedge fund analyst, auditors, and CFO. This list is displayed ONLY to show the breadth of the competition across the years. Please refer to the 2019 list above for open categories. TORIs are only open to CDI members. Each entry is $25-40 depending on quantity of categories entered. Not a member? Learn more about membership. Registration is now open for 2019 as of 1/15/19. The registration deadline to receive entry instructions is Thursday, June 27, 2019 at 12 AM Pacific time. The entry submission deadline is Tuesday, July 16, 2019 at 5:00 PM Eastern time. Important Rule: TORI entries must be created solely through your own efforts and the input of your client. However, utilizing a third-person proofreader is acceptable. Select what categories you plan to enter from the 2019 category list above. Register online for the number of TORIs you plan to submit. You can start with one in order to receive the submission rules, and then add more categories before the deadline. Once registered you will receive instructions for fictionalizing, Client permissions, naming, saving, and submitting your resume(s) via email. Refunds will not be issued should you opt not to enter a purchased category after registering or submit after the deadline. Nominations and winners will be announced via email once all judging is completed (Oct-Dec). You can save, and increase your chances to win, when you purchase multiple category entries at one time! Cart will automatically calculate the discount based on number entered. Please remember there are only eight categories. Already purchased categories this year and want to enter more*? Use this option if you are coming back to add additional categories after already registering this year. $35 US each. * Rates will not be adjusted for categories entered after the initial TORI registration purchase. Refunds will not be issued should you opt not to enter a purchased category after registering or submit after the deadline. Please plan your time during the several months available for TORI registration and entry to meet the deadlines. The TORI was a game-changer for my business. Almost immediately, I had more engaged clients from the market that I am continually seeking to attract. In fact, many of my clients find *me* because they are seeking a resume writer whose expertise has been impartially validated. Also, I find that mentioning the TORI helps in marketing me effectively on my web site and when cold calls come in. Overall, the TORI has given me more visibility and more professional credibility than I had prior to the win. I honestly believe winning a TORI award has been instrumental in catapulting my business to the next level. Whether people have heard about TORIs or not is immaterial. It’s all about education. I proudly display my TORI awards on my website and TELL the client of their value by saying, ‘Hey look no further! I’m an award-winner!’ It’s one of those things that is little work for great rewards. It takes no time to fictionalise an existing resume and provide a synopsis, but if you WIN or even if you are nominated, you have strong marketing collateral that you can repeatedly use to sing your own praises and give you that extra edge for years at no additional cost. “Thanks in part to a whole paragraph on the TORI awards I received, I landed a contract for my company to provide outplacement to 134 employees. Many of the employers are impressed that there is such a thing as resume writing awards and a body such as CDI that oversees it. The TORIs helped to elevate our credibility. In my office, I proudly display the nomination and winning certificates for all to see. I received more press coverage for the NOMINATION than I have received for virtually any other publicity over the course of my first 11 years in business. I can only speculate what kind of media attention winning a TORI would have garnered. What ‘blew me away’ (about the TORIs) was the overwhelming feedback from prospective clients. I always ask in initial communications how others heard about me. I keep track. More than one third have indicated they contacted me after learning of my TORI wins. The links to find out my status varied, i.e. my own website, LinkedIn, Twitter, referrals, etc. But the message was clear; they indicated they ‘wanted the best’ and my awards cemented their trust in my capabilities to perform to this level. The TORI has been an ROI that is quite simply, phenomenal!